The opening moments of The Long Reach seems almost like a non-sequitur. Going into the point-and-click adventure with no prior knowledge, our story starts with a normal dude going to shop for groceries on a December eve. Your avatar Calvin is a grump who’s been chastised by his girlfriend and is perpetually grumpy about his manhood. Suddenly, someone writhes on the floor. Calvin goes to call 911 in the back room, but when he returns, disaster has struck. Thus begins Painted Black Games’ The Long Reach, merely suggesting the terror to come in the next two hours. The rest of the adventure sees Calvin working in a science corporation during the Christmas holidays. Things begin to go awry as the power starts going out, your co-workers go missing, and things fall into disarray. It all centers around a office Christmas party where its hosts force you into role-playing mind quests in the name of their mysterious cult leader. 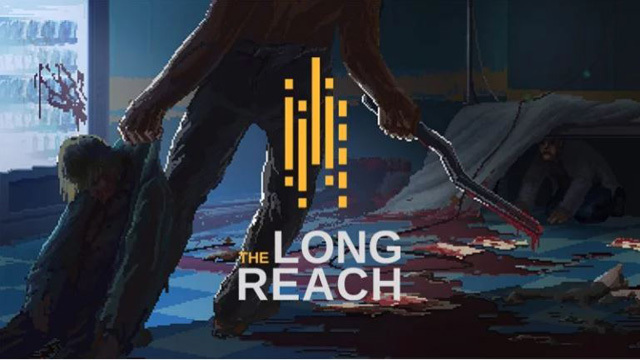 The Long Reach has an air of post-apocalypse to it despite not being post-apocalyptic, but the main themes of the story are cultism and psychological terror. Many of the game’s characters fall under a cult-like mind hive, believing in a false higher power and threatening death to outsiders that don’t comply with their instructions. Calvin is no saint, either. He slowly dips into his own form of madness as he tries to stay sane in an insane environment where everyone else is crazier and refuses help him out, pushing him further and further. In writing quality, know that Long Reach is certainly for mature players, as it’s laden with adult language, cruelty, and latent snark. The gameplay is pretty standard click-and-play design. You explore your surroundings looking for items to pick up, talk to characters using dialogue trees, and solve light puzzles to trigger events and combine items. You won’t travel across the land, but you will be stuck inside buildings a lot. Most of the environments you’ll visit are office rooms, hallways, and very rarely the outside, with one or two settings triggering the imagination. 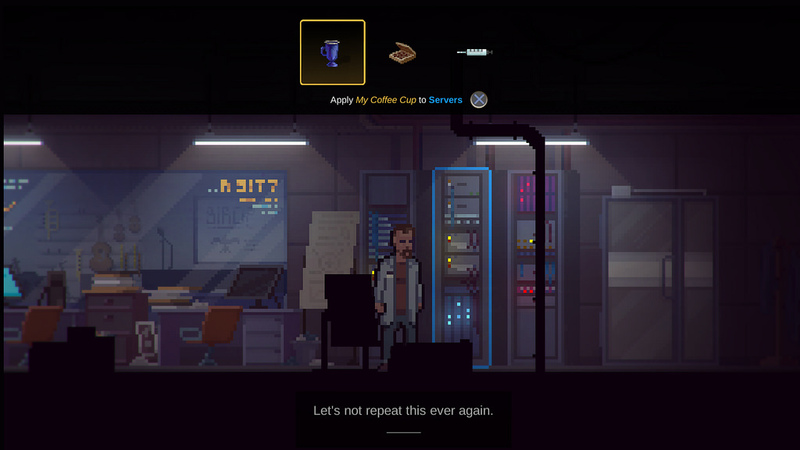 You’ll have to use simple logic and reasoning to deduce the game’s environmental puzzles, using items you’ve collected to make new ones, using something as a lock-and-key, and so on. The game’s puzzles and story flow won’t have you stuck for long and you’re never penalized for experimenting, as there’s no way to game over. Some puzzles, however, are more maddening than normal, as they may require some obscure solution that isn’t obvious. One early example happens in the opening areas, where you have to place an item and hide in the shadows for someone to come out and take the bait. The wait in question has so much variable time to execute you may not know if you pulled it off or not until minutes late. Controls couldn’t be simpler for interacting with the environment as most actions are mapped to two buttons, plus an all important trigger for using a flashlight you’ll eventually uncover. There seems to be a bug with the controls, as you’ll have to press a directional key twice to choose dialogue choices and enter doors, so things aren’t a hundred percent smooth. And in a rare instance, Calvin won’t respond to your inputs at all, requiring the pause button to return to normal and is surely the result of a minor bug. Load times are few in quantity, but when they hit between massive area changes, they seem to go far too long. 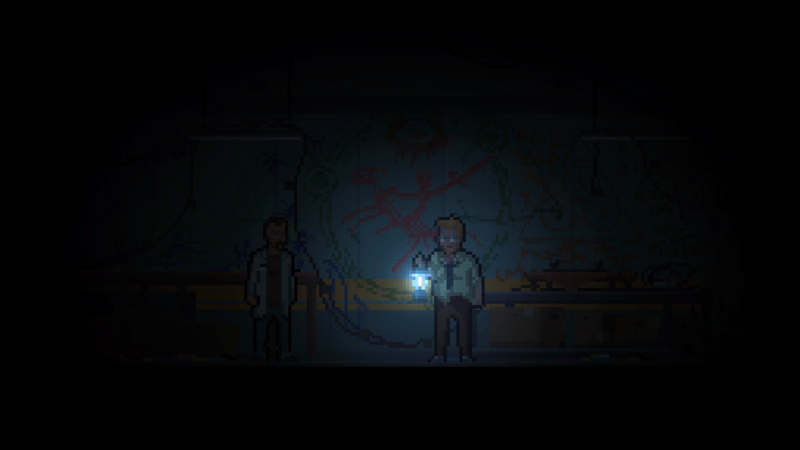 The pixel art drips with creepy atmosphere yet is quite lovingly crafted. The eerie vibe is enhanced through advanced lighting that bathes the world in a healthy glum glow. You’ll know exactly what you can interact with thanks to a yellow glow surrounding interactive objects, even some so small you need to walk slowly to not miss them. However, the game by default is a little too dark, requiring an adjustment in the menu to see just what’s going on. The real-world environment you play this in is integral to enhancing the mood of the experience, so don’t count on playing The Long Reach when it’s sunny out. There’s hardly any music to speak of, most of what you’ll hear are ambient sounds to suggest a chiller vibe. Finally on the audio front, there’s no spoken dialogue, leaving the only human voices you’ll hear be minimal sound effects from the stone cold killers. An ominous feeling of despair and lunacy prevails over The Long Reach, with Calvin trapped in a mad game that gets more insane the deeper it goes. 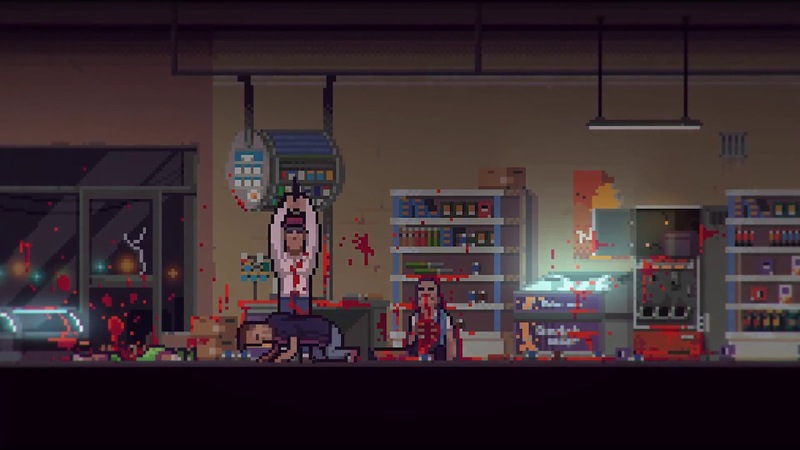 Between the lives lost and minds gone insane, it all builds up to a mid-game twist that will most certainly amuse you. The Long Reach is ultimately short and to the point. Repeat playthroughs should clock in at two and a half hours, while your first time through should be longer as you figure out puzzle solutions and experience the story for the first time. Gameplay and the presentation are mostly solid even with some technical issues notwithstanding. 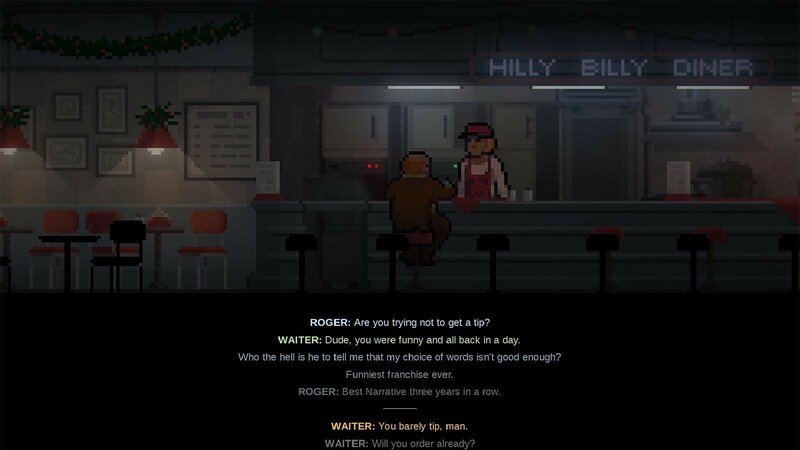 With the resurgence of point-and-click adventures in the wake of Thimbleweed Park, you could do a lot worse.